Have you heard of the Faux Silk Technique? 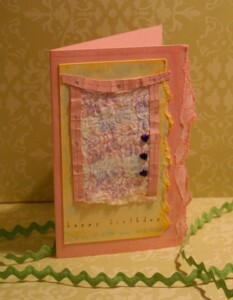 It's great for making lovely backgrounds for your cards and scrapbook pages. You can even decorate handmade boxes using this idea. "You can't make a silk purse from a sows ear"
"But you may be able to make some from paper using the faux silk technique!" Have you ever wanted the look of silk on your handmade greeting cards but thought it was too expensive to buy the real thing? Get ready to find out how to easily mimic this look. You probably have what you need in the house right now. 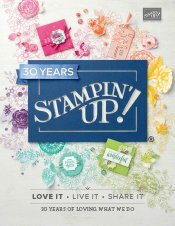 Stamp some images on the single layer of tissue with your rubber stamp. Try to create an interesting background with an all-over pattern, or you could focus just one one feature image. Here I overlapped my images using different colours of ink. A monochrome look is also lovely. 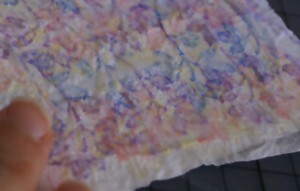 You can also look at silk material patterns for inspiration about how to create a pattern on your tissue. 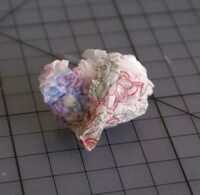 Once you have finished stamping, crumple up the tissue and then flatten it out again. You want the creases you formed by crumpling the tissue to remain once it is flattened out. Real silk fabric has such a look about it quite often. Cut a piece of cardstock a little bigger than your piece of tissue and coat it with an ordinary white glue like Clag or other school glue. The one I used came with a handy little brush inside so I used that to coat my piece of cardstock. You can use a thin white glue like Tombow Multi as well. In fact you will get a finer effect with a thinner glue so do use what you already have. 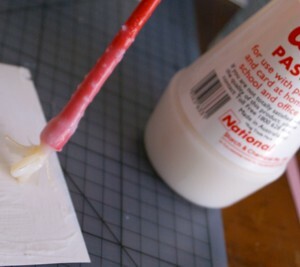 You just want the glue to be transparent when it dries, and not be too thick, so don't use hot glue! 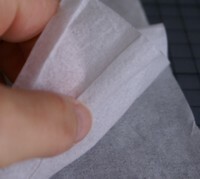 Then carefully smooth the crumpled, stamped tissue onto the glued side of the cardstock, but don't smooth it out too much. Go for a slightly crumpled look with the tissue. You want to keep some of that crumpled texture in your piece. It looks more like fabric that way. Once the glue is quite dry, you can cut the tissue and cardstock to size and use it to embellish your card or other papercraft project. Sometimes I use the raw edged piece without cutting it as I think it looks like a piece of frayed silk fabric that way. TIP: Sometimes the tissue will curl when drying so be prepared to place it under a heavy object, such as a big book, to flatten it slightly before you use it. You should probably place a piece of baking paper or waxed paper between it and your heavy object to stop it sticking to said object. Then it will look like ironed silk! Now you can see how my project turned out. I added some more pieces of coloured and folded seam binding to be my borders, and I distressed the edges of some of my cardstock layers. If you liked this technique, you might like to make faux metal or faux suede embellishments. If you make something with the faux silk technique, do show me what you have made. I would love to see it!